His Highness Sheikh Mohammed bin Rashid Al Maktoum, the Vice President, Prime Minister and Ruler of Dubai, and His Highness Sheikh Mohamed bin Zayed Al Nahyan, Crown Prince of Abu Dhabi and Deputy Supreme Commander of the UAE Armed Forces, received on Sunday at the Presidential Palace in Abu Dhabi their Highnesses of the Supreme Council Members and Rulers of the emirates and Crown Princes, on the occasion of the Holy Month of Ramadan. 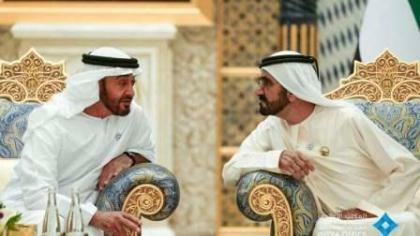 Sheikh Mohammed and Sheikh Mohamed exchanged Ramadan greetings with the leaders and Crown Princes. The gathering was also attended by government officials and dignitaries. At the gathering, their Highnesses extended warm greetings to President His Highness Sheikh Khalifa bin Zayed Al Nahyan on the advent of the holy month, wishing him good health and praying to Allah to protect him and guide the UAE towards more progress and prosperity. They also extended greetings to the heroes of the UAE Armed Forces and expressed pride of the sacrifices the nation's martyrs. They recalled the achievements of the founding father the late Sheikh Zayed bin Sultan Al Nahyan, as the UAE marks 2018 as the 'Year of Zayed,' which coincides with the 100th birth anniversary of the founding father - whose legacy is guiding the nation to a bright future. The leaders also added that under the wise leadership of Sheikh Khalifa bin Zayed Al Nahyan, the UAE is following in the footsteps of the late Sheikh Zayed, inspired by his principles, values and rich legacy. The leaders performed the Maghrib prayer which was led by Mohammed Matar Al Kaabi, Chairman of the General Authority for Islamic Affairs and Endowments. Sheikh Mohamed hosted an Iftar - attended by Sheikhs, ministers and senior officials.